BRICS countries have experienced, to some extent, constant economic growth and industrialization over the past two decades. During the financial crisis of 2009, the Indian and Chinese economies continued to achieve close to double-digit growth; while the other BRICS economies faced significantly lower or negative growth values for that year, most of them are expected to continue on a growth trajectory. For South Africa, India, China and Brazil, growth has come from expansion in heavy industries, manufacturing, mining and construction, while Russia has pursued the expansion of production and export of oil and gas. In recent years, BRICS economies have increasingly come under the spotlight for the contribution to climate change of their energy- and carbon-intensive economies (with the exception of Brazil, whose energy mix is dominated by hydropower). However, some key changes to the energy systems across BRICS are underway: China and India have both set targets to reduce the energy intensity of their economies, and all the BRICS economies are aiming to increase the share of renewables in the energy mix. In Brazil, discoveries in pre-salt offshore fields are expected to improve the country’s energy security. As evidenced by the industrialization of the BRICS economies, energy intensity is a key challenge for the economic cluster, which receives one of the lowest average performances globally for this indicator, achieving an average score of 0.29/1 against the global average of 0.45/1. With the exception of Brazil, whose power-generating sector is dominated by hydro, BRICS economies are heavily dependent on fossil fuel sources for power generation – thus impacting the environmental and emission score indicators. 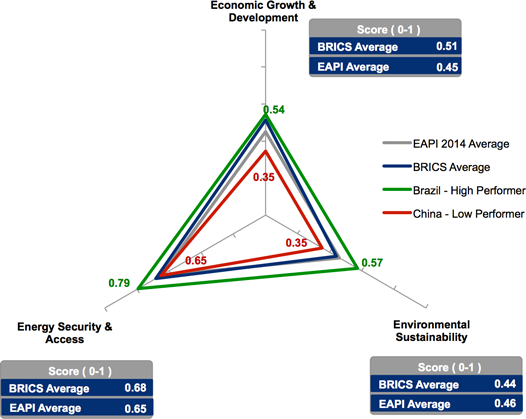 Within the BRICS cluster, Brazil achieves the highest score of 0.64/1, while the lowest performer, China, ranks below the EAPI average with a score of 0.45/1. 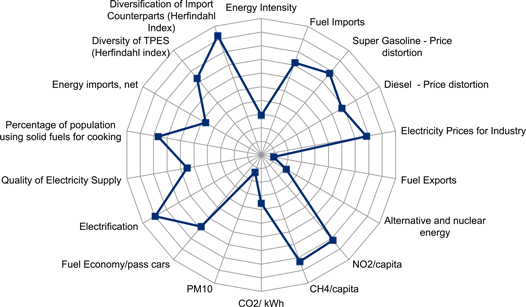 The different requirements of the energy systems of these economies are highlighted in the wide disparity of scores across the EAPI and within each dimension of the energy triangle. China and India receive their lowest scores in the energy security and environmental sustainability dimensions, underlining the challenges these countries face in diversifying their energy mix beyond fossil fuels and their increasing reliance on imports. Russia’s extensive oil and gas reserves mean the country performs better than its peers across the energy security indicators; however, the environmental consequences of its resource wealth impact scores in the environmental sustainability dimension. Russia is the best performer across the economic growth and development dimension for the BRICS cluster. Although the country achieves the lowest performance across the cluster for liquid fuel subsidies, it achieves a score of 0.33/1 for the contribution to GDP of fuel exports, compared with the 0.03/1 average for the rest of the cluster. This highlights the country’s extensive natural resource wealth and export activities, with exports contributing to over 18% of GDP in 2012. Energy intensity is a key challenge for all BRICS economies, which – apart from Brazil scoring 0.53/1 for this indicator – score within the lower quartile globally with an average of 0.23/1. This highlights the high industrialization level of BRICS economies and, to some extent, the inefficient use of energy brought about by continuing energy subsidies in Russia, India and South Africa. Energy intensity is a key challenge for all BRICS economies. China, Russia and South Africa have the most energy-intensive economies in this cluster, averaging US$ 4.6 GDP per unit of energy use, highlighting the reliance of these countries on energy-intensive industries such as petrochemicals in the case of Russia and heavy industry, mining and manufacturing in the others. This level of performance highlights opportunities for improvement through the roll-out of energy efficiency measures, as well as seeking to diversify the economy beyond industrial activities. Improving on energy intensity continues to be a key focus area for China, whose latest Five-Year Plan includes a target for reducing energy use per unit of GDP by 16% on 2010 levels by 2015. Among a range of efficiency initiatives, the plan envisages a refocus of the economy towards growth in the service sector. Brazil has the least energy-intensive economy of all the BRICS countries, with US$ 8.20 GDP/unit of energy in 2011 – a 26% improvement on 2000 levels. Energy efficiency in Brazil can in part be attributed to the high price of energy compared to global and BRICS pricing. While Brazil ranks 51st for this indicator globally, other BRICS countries sit within the top 20. Higher electricity prices have, to some extent, driven more efficient use of energy and investment into more efficient technologies. However, in an effort to boost growth and improve competitiveness, the Brazilian government recently announced plans to reduce the cost of electricity to industry by up to 32%.73 It is unclear to what extent this will impact further dissemination and deployment of efficient technologies in the long term. Russia and India share the lowest performance for the indicator on liquid fuel subsidies; Russia achieves a score of 0.60/1 against the regional average of 0.82/1 for subsidies in the price of super gasoline, while India’s subsidies for diesel put it in the lower quartile globally for this indicator. Although subsidies are more common in resource-rich countries such as Russia, they are employed by developing economies such as India and South Africa to improve energy affordability and access for lower-income groups. To date, limited action has been taken to eradicate subsidies and international calls for a phase-out have encountered widespread public opposition in countries where subsidies are in use. Although the phasing-out of subsidies is one of Russia’s energy sustainability priorities during its G20 leadership in 2013, no detailed long-term strategy has been set. Meanwhile, in India, the poorest districts in the country are piloting a scheme to improve subsidy administration for LPG to target only the lowest-income group. Known as the Direct Benefit Transfer scheme (a poverty alleviation programme which targets those living below the poverty line74), this will see the difference between the market and subsidy price of LPG being paid directly to participants (to a maximum of nine cylinders a year). The lowest average score for BRICS countries across the three dimensions of the energy triangle is for environmental sustainability. With the exception of Brazil, where hydropower is a significant component of the country’s energy mix, the other BRICS economies are more significantly reliant on coal and other fossil fuels for power. Industrial and petrochemical activity means that emission intensity in PM10, nitrous oxide and methane is also a major issue for these countries. Limiting the environmental impact of energy production and consumption, while continuing to foster economic growth, is a key focus for countries in the BRICS cluster. Some elements of the challenges that this creates are covered in the sections below, with further analysis of the issue provided in the final section of this chapter. Brazil achieves the highest score of 0.57/1, compared with the average of 0.41/1 for the rest of the BRICS cluster. This performance is largely driven by the 45% contribution of alternative and nuclear power to the total primary energy supply of the country. In 2011, 80% of the electricity produced in Brazil75 came from hydro, affording Brazil a significantly higher score for the carbon efficiency of its power-generating sector; Brazil’s 0.91/1 score is in stark contrast to India, China and South Africa’s average of 0.09/1. Brazil is planning the further expansion of hydro capacity, as well as growing the share of modern renewables in the energy mix to limit dependence on annual rainfall to feed hydro power. The predominance of coal in the energy mix of India, China and South Africa defines the scores of these countries across emission-related indicators. The three countries rank among the lowest globally for CO2 emissions from the power-generating sector, with average performance of 0.09/1 against the global average of 0.54/1. A number of policies have already been rolled out in some of the BRICS cluster nations to address the carbon intensity of power generation – including emission-trading schemes and fiscal disincentives for coal – and further policies are planned. China has started piloting carbon-trading schemes in some of its more emission-intensive regions, with plans for countrywide roll-out by 2020. India has imposed a tax on coal production and importation since 2010; South Africa has indicated it will introduce a carbon tax starting in 2015 and China has suggested that resource tax reform may include a coal tax. The performance of India and China is also marked by high PM10 emissions of an average 54 mg/m3 against the lower than 20 mg/m3 annual mean stipulated by World Health Organization air quality guidelines. Local pollution in China gained significant media attention in January 2013, when protests erupted in major Chinese cities that pressured the government to address emissions abatement. Later that year, China unveiled its 10-Point Plan including key measures such as stricter controls on coal-burning emissions and road traffic, which seek to push energy consumers to use cleaner energy sources and use public transport.76 Furthermore, China announced a potential ban on new coal-fired power plants in parts of Beijing, Shanghai and Guangzhou. The energy security landscape is quite varied within the BRICS cluster. Brazil and Russia achieve largely similar scores (averaging 0.79/1), while India, the lowest performer, scores 0.54/1, putting the country in the lower quartile globally for this dimension. The drivers behind the performance of BRICS economies vary, ranging from issues of import dependence and low electrification rates in India, to lack of diversity in primary energy sources in Russia, China and South Africa. Although Russia’s energy sector is not as diversified as Brazil’s, its vast oil and natural gas resources afford it a higher than average performance in the BRICS cluster. In 2012, Russia exported over 80% of domestic consumption, compared to the only other net exporter in the cluster, South Africa, which exported just 18%. Activities geared to increasing Russia’s production of both oil and natural gas are on-going, including Arctic exploration. China and India import, respectively, 11% and 28% of net energy consumption. This makes them the most energy-dependent of the BRICS economies. With growing energy demand largely outstripping internal resources, India and China’s dependence on energy imports is expected to continue. That said, China ranks in first place globally for the diversification of its import counterparts, up from its 4th place ranking in 2008. This underscores China’s success in establishing strategic partnerships with, and investing in, major oil and gas producers such as Iraq, Russia and more recently Canada. Beyond assuring import supply for net importers with growing energy demand such as India and China, mitigation of energy security challenges can be supported by implementation of efficiency improvements to curb demand and through diversification of energy sources. China’s Five-Year Plan includes aggressive targets to increase the share of renewables in the energy mix – with the bulk of installed capacity additions of 2012 coming from hydro and nuclear. Similarly, India is rolling out low-carbon power generation through plans to increase nuclear capacity from the current 4.4 GW to 5.3 GW by 2016.78 Alongside a number of national and international initiatives to improve energy access, India has launched a Remote Village Electrification programme that includes targets for deploying off-grid renewables to rural communities. Brazil, China and South Africa have been successful in addressing access to energy during the period of economic growth. During this decade, policies for delivering rapid on-grid and off-grid expansion have meant access in rural settings grew from 80% to 94% in Brazil, and from 37% to 64% in South Africa. Brazil’s Luz Para Todos programme, coordinated by the Ministry of Mines and Energy, was instrumental in delivering access to energy by supporting rural communities in purchasing and installing distributed renewable energy. 75 EIA, Country Analysis, Brazil. 77 EIA, Country Analysis, Brazil. 78 Further, India’s Ministry of New and Renewable Energy set out a strategy for 2011-2017 which targets installed capacity from new renewables to reach 21,700 MW during the six-year period, supported by national and state-led policies including feed-in tariffs and renewable purchase obligations. Energy access across BRICS is high, with the exception of India and South Africa which continue to face lower rates for rural and low-income groups. India is the lowest performer within the BRICS cluster, with only 75% access to modern energy. This equates to 293 million people lacking access to modern energy, compared to 4 million in China. [fn 79 World Energy Outlook 2012. Paris, France: IEA.